Download the LAPS application here. Install the LAPS Application on the DC (Powershell Module and GPO Editor Templates are needed). Additionally you have to set, who can read the ms-Mcs-AdmPwd Attribut in Active Directory. You have to install the LAPS tool on every client, so he has the needed GPO extensions available. The default installation through the MSI installs and registers only a dll. 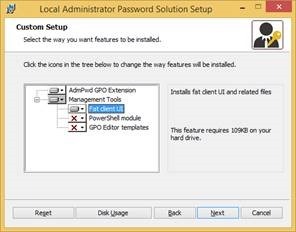 The installation of the full LAPS tool on a management client will copy the AdmPwd.admx to c:\Windows\PolicyDefinitions and the AdmPwd.adml file to c:\Windows\PolicyDefinitions\en-US. Copy this admx file to your Domain Controller respectively to your central store for admx files (c:\windows\sysvol\sysvol\%domain%\policies\policydefinitions) and the ADML file to the subfolder en-US. * if you renamed the local administrator account it is still working because it looks for the SID. Apply the GPO to your client Organization Unit (OU). For the admins with the permission to read the passwords in AD, you can deploy a User Interface or inform them, how they can see it in the User and Computers Console (Computer Object – Attribute Editor – ms-Mcs-AdmPwd). 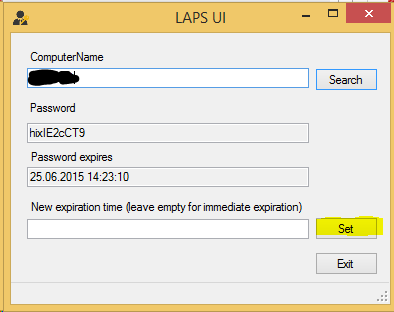 For installing the LAPS User Interface, choose the “Fat client UI”. In the tool you have also the possibility, to set a new password. Click “Set” and it will be changed immediately. How do you deploy LAPS silently with ‘management tools’ enabled? Do you know any customers which have this tool in production? yes I know some customers using it, where I configured it 🙂 – and it’s working really great. The tool is not new, it’s only new for free / open (before it was only available for microsoft consulting services)… so I think it’s used in several companies. I changed local admin account manually on the computer successfully, but it doesn’t sync with the domain controller LAPS password. Any idea why it is not syncing? Shouldn’t it also show the changed password on LAPS UI. The password I changed logs me in successfully, not the one on the domain controller. Replying to an old comment but for the benefit of others – the tool can only sync passwords to AD when it sets them. It does not check for manually changed passwords and even if it did, it would not be able to decrypt a manually set password.